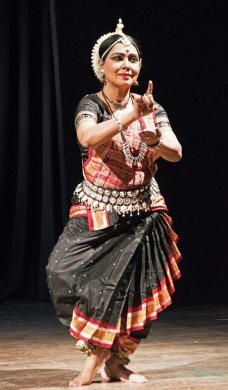 Odissi dancer Aruna Mohanty shows at the opening performance of Nrityodaya Charitable Trust's three-day Nrityolsavam at Chandravadan Mehta Auditorium (March 22) in Vadodara what it takes to be different and recognized. In both her performances, Sansara and Pratinayaka, there were familiar episodes, one from the human lifecycle and the other from our metaphoric myths. They were presented in an idiom - in terms of abhinaya and interpretation - the modern mind could understand. With these elements she built the viewers' confidence in her in the short introductory piece Sansara. On her part, the confidence emanates from the mastery of the technique that gives her felicity in the use of its vocabulary and from an alert mind that makes her presentation intelligible. With the musical syllables ta na de re na supporting the mystery of the lifecycle she just gives glimpses of childhood, adolescence, youth, old age and the inevitable end with the traits attending them. Suggesting that only the soul leaves the body, in continuity she ushers in the philosophy of advaita with Shankaracharya's Bhaja Govindam. With the suggestion of all directions, the limitless space above and a withdrawing puny body, its melting into the all-pervading universal consciousness gets conveyed, economically and so tellingly. Her Pratinayaka is significant in its conception and performance. Nayaka and Pratinayaka exist in every human being - he is bafflingly created with these contradictions within him - and they coexist in the universe as well. Puffed-up, he goes to the extent of daring the Creator and asserting, 'I am because you are.' Pratinayaka plays up this duality, different from bipolarity, with a high sense of drama within the bounds of aesthetic control. Pratinayaka is not the antihero of the western concept. He is a prototype of Nayaka. Dancer-choreographer Aruna engagingly portrays in her smoothly flowing solo performance the battles between the divine and evil elements fought across epochs - between Hiranyakashipu and Prahlada (Satya Yuga), Rama and Ravana (Treta Yuga) and Krishna and Kansa (Dwapara Yuga). The evil, fierce in proportion, gets vanquished and Truth triumphant. Finally, the battle extends to Kali Yuga, which is ongoing. Man is intoxicated with the transient and illusory power that possessions and passions give. Ayswaria Wariar, founder-director of Nrityodaya School of Dance, presented a Mohiniattam solo Bhoomiputri Seeta from her longer choreographic work Mandodari-Seeta. 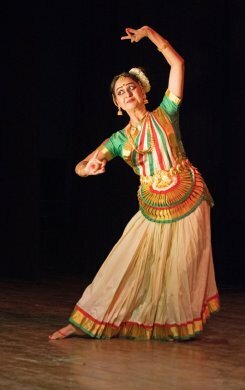 She brings the flavour of Kerala in her dance with the Sopanam music, a predominantly off-white costume, a rich Manipravalam text and the slow-paced lyrical lasya abhinaya characteristic of the form that becomes an appropriate medium for the nayika of Bhoomiputri Seeta, also choreographed by her. Shiva Prasad's vocal recital in his compositions lends a strong support to Ayswaria's portrayal of Seeta and the values she represents. The theme has an affinity with that of the Odissi dance earlier presented in a larger context. Ravana bloated with his power and seeking indulgence in more desires is in combat metaphorically and in reality with the Uttama Nayaka Rama, a Sooryavanshi by descent and dheera-gambheera in his demeanour. Seeta repulses the devilish designs of Ravana. 'My mind and soul are with Lord Rama,' she tells the antagonist in no uncertain terms, 'and if you try to take my body, made up of panchamahabhoota, I will put an end to it.' The world with the evil in it is illusory and perishable, her character establishes, it is the divine that is constant. Her five students (Arunima, Vrunda, Shagun, Veen, Krishika) presented Maya Mohanam pretty well. It included Draupadi Vastraharana, Geetopadesha and Gajendramoksha under her choreography and K N Panicker's verbal portrayal. This short piece reaffirms the supremacy of the all-pervading element of the divine.